A disease of the vascular system of oak trees which is transmitted through the air by insects and through the root system of neighboring trees by natural grafting. Apply the Sick Tree Treatment – click here. Oak wilt attacks red oaks and live oaks especially when they occur in large monocultures and are treated with synthetic fertilizers and pesticides. The disease on red oaks shows up first as greasy green leaves that then turn brown starting on the ends, usually seen on one limb at a time. Live oak leaves have veinal necrosis (brown veins and green in between). Some leaves will be dead on the end half. Red oaks have sweet smelling fungal mats on the trunks. Dutch elm disease is closely related. I do not recommend injecting fungicides into trees and I don’t recommend removing trees that are near sick trees. The chemical injection hurts the tree, wastes money and doesn’t address the real problem. This procedure has been pushed by Texas A&M and the Texas Forest Service for many years and I have yet had anyone report that the fungicide injections have ever saved a single infected tree. All species of oak trees are susceptible to oak wilt. Trees in the red oak group, including red and pin oaks, are highly susceptible and usually die within a few weeks following infection. Trees in the white oak group, including white and bur oaks, are more resistant and may survive for one or more years. Since oak wilt causes drought-like symptoms, it may be easily confused with other stress-related factors. These factors include construction damage, drought stress, or insect colonization. In addition, oak wilt is often confused with the common springtime disease, anthracnose. In contrast to oak wilt, anthracnose causes spotting, curling and browning of the leaves in the lower canopy. In rare cases oak wilt may cause brown streaking of the inner sapwood. This streaking is a good diagnostic symptom for detecting infected trees. Oak wilt is a fungal vascular wilt disease which is transmitted to healthy trees through below-ground root to root contact or Nitidulid (picnic) beetle feeding. Northern pin and red oaks are less resistant to oak wilt than bur and white oak. The best prevention for oak wilt is the organic program and the Sick Tree Treatment for stressed trees. We have anecdotal evidence that these techniques are curative as well as preventative. Here's some additional information about the disease. 1Principal Entomologist, U.S. Department of Agriculture, Forest Service, Northeastern Forest Experiment Station, Delaware, Ohio. 2Forest Pathologist, U.S. Department of Agriculture, Forest Service, Southern Region, State and Private Forestry, Forest Pest Management, Atlanta, Ga.
Oak wilt, caused by the fungus Ceratocystis fagacearum (Bretz) Hunt, kills oak trees. It has been found in 21 States, with considerable damage occurring in the Midwest. It was first recognized as an important disease in 1944 in Wisconsin (fig. 1) where, in localized areas (less than 100 acres (40.4 ha)), over half the oaks have been killed. Surveys in eight Wisconsin counties showed that about 11 percent of the annual growth increase of oak forests was offset by mortality caused by oak wilt. In other States, the fungus kills thousands of trees; however, this loss is only a fraction of the total oak timber volume. In West Virginia, for example, where predominately oak forests cover 70 percent of the land area, oak wilt losses average less than one tree per square mile each year. Oak wilt has also been reported in Texas - outside its main range. No species of oak is known to be immune to this vascular disease. Infections have been found in 16 native oak species, including most of those of commercial importance. Species of red oak get the disease more frequently and succumb more readily than white oak. Plantation-grown Chinese chestnuts can also be naturally infected by the oak wilt fungus. Moreover, inoculation experiments have demonstrated that over 35 native and exotic oaks are susceptible, as well as American and European chestnuts, species of chinkapin, tanoak, and several varieties of apple. The main period of infection is in the spring, when new vessel wood is being formed. Symptoms in red oak occur as early as May. The leaves turn dull green or bronze, appear water-soaked, wilt, and then turn yellow or brown. Damage occurs from the tip and outer edges toward the midrib and base. Wilting leaves typically curl around the midrib and the line between the bronze and green tissues in individual leaves is very distinct (fig. 2). These symptoms quickly appear throughout the crown, often within a few weeks, and leaves at the ends of branches are shed (fig. 3). Figure 2. - Oak wilt symptonms on red oak leaves. Heavy defoliation accompanies leaf wilting and discoloration. Leaves fall in all stages of discoloration. Even entirely green leaves may fall from affected branches. Some affected branches hold green leaves longer than others~sometimes until autumn. Therefore, the crowns of trees with oak wilt are seldom as uniformly brown as those of nondiseased trees that have been poisoned, girdled, or killed by lightning. In dry years, the appearance of trees with oak wilt may be confused with that of trees with drought symptoms. The disease progresses rapidly, and some trees die within 1 or 2 months after the onset of symptoms. Most trees die within a year. Sprouts frequently grow from the bole and larger branches during the year of defoliation or the following year. Fungus mats (fig. 4) are commonly associated with red oaks in some sections of the country, especially Wisconsin, Minnesota, Iowa, and Illinois. These mats, composed primarily of mycelium, form beneath the bark. Sometimes the mats raise and crack the bark giving off a fermenting odor that attracts insects. Discoloration of infected annual rings is seldom a symptom of oak wilt in the red oak group. The disease symptoms are much more variable in white oaks, although the foliage symptoms are often the same. In a few, particularly bur oaks, symptoms are essentially the same as in the red oaks, and the tree may die within one growing season. Usually, however, white oaks die slowly. Only one or two branches may show symptoms and die in a year. If the fungus persists, a few branches are killed in a season; and over several years, the tree de clines and may eventually die. Some white oaks seem to recover from the disease, but may harbor the pathogen and serve as symptomless reservoirs. White oaks, unlike the red, frequently have discolored infected annual rings when diseased. Fungus mats seldom appear on white oaks. Figure 5. - Root grafts between oaks. Natural root grafts and insect vectors spread the oak wilt fungus from diseased to healthy trees. Healthy oaks growing next to infected ones become infected through their roots. Root grafts (fig. 5) offer a path to transmit the fungus and are a major factor in the spread, especially in areas with deep, sandy soils and dense, pure stands of red oaks. The fungus overwinters as mycelium in still-living, infested trees and as fungus pads on dead trees. The fungus can be spread more than a mile by at least two groups of insects: sap and bark-feeding beetles. When the fungus mats enlarge and crack the bark (fig. 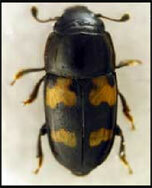 6), the emitted odor attracts insects such as sap-feeding beetles in the family Nitidulidae (fig. 7). When the beetles feed on the mats of the infected tree, fungus spores adhere to their bodies. As the beetles move from diseased trees to wounds on healthy oaks, the disease- causing spores are transmitted to a new host. Oak bark beetles, Pseudopityophihorus spp., also transmit the fungus. They breed abundantly beneath the bark of oak wilt- infected trees (fig. 8). After egg laying, parents emerge carrying spores and feed on healthy oaks (fig.9). When the larvae hatch and develop into adults, they also carry infective spores and move to healthy trees. Those bark beetles that overwinter in infected trees can transmit the spores to healthy trees when they move about the following spring. When transmitted, the pathogen spreads rapidly within xylem vessels. Besides the bark beetles, a number of other contaminated insects have been collected from diseased trees. Whether or not they spread the pathogen has not been conclusively proven, however. Unfortunately, there is no known way to save an oak tree infected by the oak wilt fungus. The only way to maintain healthy trees is through prevention. Early detection and prompt removal of dead or dying trees and breaking root grafts between diseased and healthy trees are essential. Mechanical and chemical barriers between diseased and healthy trees can halt the spread of the oak wilt fungus through root grafts. A trencher or vibrating plow can be used to cut or break the tree roots down to a depth of 2 to 4 feet (0.6 to 1.2 m). Soil fumigants can also be used to kill the connecting roots between trees. Detailed procedures for constructing mechanical and chemical barriers are given in the referenced pamphlet on oak wilt by French and Stienstra. Promptness is important. The sooner the root grafts between diseased and healthy trees are destroyed, the better the chances for saving the trees nearby. To suppress overland spread of the fungus, control must be aimed at destroying the source of inoculum - the diseased tree - at the proper time. All trees that die in any given year should be checked carefully for fungus mats and oak bark beetle colonization by April 1 of the following year. If the mats or beetles are present, the entire tree should be burned, chipped, or covered with plastic for 60 days. In the Eastern United States, about 50 percent of diseased trees contain beetles and about 25 percent produce mats; however, these figures may vary, depending on geographic location. Fresh pruning wounds may attract beetles contaminated with oak wilt fungus. Because of this, avoid unnecessary pruning and prune in winter whenever possible. Trees should not be pruned during April, May, or June or whenever the beetles are active. If shade or forest trees are suspected of having oak wilt, contact the county agricultural agent, State agricultural experiment station, or local forester for control recommendations. Anderson, R. L.; Skilling, D. D. Oak wilt damage: a survey in central Wisconsin. Sta. Pap. 33. St. Paul, MN: U.S. Department of Agriculture, Forest Service, North Central Forest Experiment Station; 1955: 1-11. French, D. W.; Stienstra, Ward C. Oak wilt. Minneapolis, MN: University of Minnesota Agricultural Extension Service; 1980; Folder 310:11. Rexrode, Charles 0.; Jones, Thomas W. Oak bark beetles-important vectors of oak wilt. J. For. 68: 294-297; 1970. True, R. P.; Barnett,--H. L.; Dorsey, C. K.; Leach, J. G. Oak wilt in West Virginia. Bull. 448T. Morgantown, WV: West Virginia University Agricultural Experiment Station; 1960: 119.